Several weeks ago, a remarkable meeting was held on the University of Maryland campus in Hyattsville, Maryland sponsored by the National Science Foundation entitled “Challenges in Vertical Farming”. It was well-organized by Dr. Sanjiv Singh and colleagues at Carnegie Mellon University. In attendance were over seventy people from a wide number of disciplines that converge on the concept of vertical farming – LED grow lighting, robotics, aeroponics and hydroponics, rooftop greenhouse crop production, agricultural economics to name a few. There were several scientists from national space agencies (USA and Germany) in attendance, and many others from various universities (e.g., U. Arizona, Chiba University, Kyoto University, Columbia University, Carnegie Mellon University). In addition, there were several commercial controlled environment growers (Gotham Greens and AeroFarms) to offer their take on the practicality of growing crops indoors. The theme of the conference was to identify issues that needed to be addressed before commercially viable vertical farms could be contemplated. Sixteen speakers presented their views on numerous subjects over the course of the day. As the conference progressed, it became obvious that many of the perceived impracticalities of vertical farming were already being addressed, and remarkably some had even been resolved. 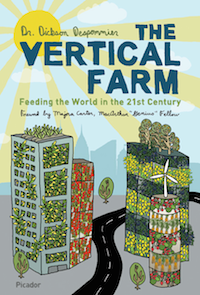 None of the participants in attendance, nor the 200 or so who had logged on to the live feed streaming online, offered the view that vertical farms were impractical and or unrealistic (a common opinion offered by numerous early critics of the concept). To the contrary, everyone who spoke identified numerous technological solutions to bottleneck issues such as efficiency of LED grow lights. Current LEDs are commercially available at only 28% efficiency, but they need to be around 50-60% efficient when considering the economics of operating an indoor farm. One participant offered that he had attended a conference the week before on LED lighting and a physicist attending that same meeting announced that the theoretical efficiency for LED lights is an astounding 100%! We learned also that at least one large internationally recognized leader in LED lighting technology had already invented an LED system that was 50% efficient, but the company was not yet willing to make it commercially available. If true, this would greatly alter the perception on the part of some skeptics of vertical farming that it’s the excessively expensive energy needed by any indoor farm that is standing in the way of commercial development. The second day of the conference was devoted to brainstorming for ideas to address the issues identified the day before. All of the four groups of speakers agreed that efficiency of LED lights needed to be far higher to advance to the commercial stage of the concept. Let’s challenge the LED manufacturers to form a consortium and make high efficiency LED grow lighting systems available now! 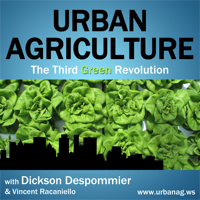 Bring on the urban high rise farming industry!